Citation: Yasser Ali Kamal. Sprengel deformity: An update on the surgical management. Pulsus J Surg Res. 2018;2(2):64-68. Sprengel deformity (SD), undescended scapula or high scapula is the most common congenital abnormality of the shoulder girdle. The aim of this article is to review the literature for updates on the surgical management of SD. The etiological theories of SD remain to be based on a developmental arrest of the intrauterine normal descent of the scapula. The deformity often coexists with other syndromes and medical conditions including Klippel-Feil syndrome, scoliosis, and rib abnormalities. The imaging evaluation is based on chest X-ray, CT with 3-D reconstruction and MRI to determine the deformity and its association with omovertebral bone. The plan for treatment is judged by the Cavendish classification of clinical cosmetic appearance, as well as shoulder functional impairment. Mild cases need no surgical intervention, however, there are several surgical procedures preserved for moderate to severe cases with near similar postoperative outcomes. The commonly performed procedures include Green's and Woodward procedures with further modifications to enhance the early mobilization and to reduce the associated brachial plexus injury. The use of minimally invasive techniques for SD is limited but it may take its place in the future. Sprengel deformity (SD) is a rare congenital malformation of the scapula, named after Otta Gerhard Karl Sprengel in 1891 , who suggested that increased amniotic fluid pressure interfered with the descent of the scapula, hence the appellation deformity [1,2]. By 1908, there were 136 published cases with SD . Normally, the scapula lies superiorly at the level of the 2nd vertebra and inferiorly at the level of the 7th or 8th vertebra, but in patients with SD, the scapula is elevated, dysplastic and medially rotated at the inferior pole, with the glenoid directed inferiorly. Moreover, an omovertebral bone or band connecting the cervical vertebral spinous processes to the scapula may found in up to 50% of cases with SD [2,4,5]. The main complaint of a child with SD includes cosmetic deformity and limitation of the abduction of the shoulder. Other congenital anomalies may coexist with SD including scoliosis, rib anomalies, Klippel-Feil syndrome and diastematomyelia [6,7]. The initial imaging workup for the assessment of SD should include plain radiography and computed tomography (CT) to assess the level of the scapula, determine the associated abnormalities, and delineate an omovertebral bone or band. Moreover, the complex anatomy and omovertebral connection can be screened best with 3D CT or MRI [8,9]. The treatment may be non-surgical or surgical according to the degree of cosmetic and functional affection by SD. Many operative procedures have been described to correct SD [10-13]; however, a controversy remains about the appropriate procedure. In this review article, we try to review the literature for the updated knowledge about the etiology, diagnosis, and treatment of SD. The embryological development of scapula starts between the 4th and 8th weeks of gestation, where it is initially located at the level of 4th cervical vertebra, then it grows and migrates under cellular signaling pathways guide to the final location at the level of the 7th thoracic vertebra at the 6th week of gestation. Growth arrest of the scapula or the surrounding muscles results in failure of the scapula to descend leaving it hypoplastic and malrotated at a high level . The etiology of SD remains unclear; however, it is generally related to a developmental arrest of the intrauterine normal scapular descent [15,16], with a proposed primary defect including oligohydramnios, cerebrospinal bleb, or the axial skeleton of neural crest origin [3,17]. Notwithstanding the deformity usually occurs as a sporadic event, some cases show Mendelian inheritance . Moreover, the proposed etiologies of SD include isolation or combination of vascular lesions arising from the subclavian artery distribution and autosomal dominant inheritance, but the sporadic nature of the most of cases is against the exclusive mutual etiology [18-20]. Recently, some authors considered SD as a part of (undescended scapular syndrome), which considered the association of scapular and urogenital anomalies. From an embryological perspective, the proposed etiology by the authors relies on the presence of an accessory bony or fibrous band which prevents scapular descent, thus SD should be referred to as an undescended scapula and not as elevated or high scapula . There are various explanations of the origin of omovertebral bone in cases with SD, including the process of bone in connection with the vertebra, the ossification of the connective tissue in the intermuscular plane, or a scapular element secondarily fused to the spine . In some cases of SD and bony connections, there may be a scapular hypoplasia but normal appendages (acromion, scapular spine, glenoid, and coracoid), which suggests independent expression of the genes governing scapular body development (EMX2) and development of appendages (HOXC6 and PAX1) . Thus, a continuation of the normal scapular development leads to the development of tendomuscular ossification and formation of the scapular body, while the arrest of the scapular growth in an abnormal position leads to additional bony development such as cleithrum in extreme cases (continuous bony ring from the spine to the manubrium) . Although SD is a rare entity, it is the most common congenital malformation of the shoulder girdle . Notwithstanding the deformity is three times more predominant in male than female gender , it may occur equally in both sexes . Unilateral location of SD is more frequent with a predilection for the left side; however, bilateral cases can exist with less disfigurement and more functional limitation than unilateral cases . The first clinical presentation of SD is often during childhood in the first or second year of life, or later during adolescence [15,27]. The main complaint in cases of SD is disfigurement due to the asymmetry of the shoulder girdle, in addition to functional impairment (Figure 1). Limited scapulothoracic motion leads partly to a reduction of glenohumeral abduction which is generally well tolerated . Figure 1: A photograph of a child with Sprengel's deformity: (A) asymmetry of shoulder girdles with the higher position of the left scapula with asymmetry in the position of inferior scapular poles (dashed lines), and (B) limited right glenohumeral abduction. The clinical presentation of SD usually includes other skeletal deformities in the thoracic rib cage and the cervical and thoracic vertebrae such as scoliosis, fused or absent ribs, chest wall asymmetry, cervical ribs, and cervical spina bifida. Moreover, SD is linked to various syndromes, including Klippel-Feil syndrome, X-linked dominant hydrocephalus, mental disturbance syndrome and diastematomyelia [21,28]. Plain chest X-ray can show the abnormal position and rotation of a scapula (Figure 2). The anteroposterior view can estimate the height difference between normally situated and high scapula using the easily visualized inferior angle of the scapulae, however, chest X-ray is not accurate enough to estimate the severity of SD . Figure 2: Plain chest X-ray shows the abnormal elevation of the left scapula with the prominent superior angle of the scapula in the web of the neck. The deformity can be assessed using frontal radiographs to determine the relation of the superomedial angle to the vertebral column as proposed by Rigault [29,30]. The oblique radiographic view can be used to assess the presence of the omovertebral bone between the superomedial angle of the scapula and the vertebral column . Additional radiological findings should be calculated including medialization of the scapula (the rotational difference of the two scapulae), and the anterior curvature of the supraspinous part of the scapula. The scapular medialization is calculated by measuring the distance between the medial border of the scapula and a vertical line over the C7 spinous process . Computed tomography (CT) with multiplanar and 3D reconstructions images is useful in quantification of scapular dysplasia, demonstration of omovertebral bone, and assessment of the associated vertebral and rib anomalies. On CT images of the chest, both scapulae are not situated at the same level with images showing absent contralateral scapula particularly in an axial plane of the back of a child (Figure 3). Moreover, CT with 3D reconstruction images can accurately demonstrate omovertebral bone which confirms the diagnosis of SD (Figure 4) [33-35]. Figure 3: Axial CT image showing a high level of the right scapula. Figure 4: Chest CT 3D reconstruction image, posterior view showing elevated left scapula with omovertebral bone (arrow) between the scapula and cervical spinous process. Other imaging modalities are not routinely used but may add variable advantages when indicated. Ultrasound is useful for detection of the cartilaginous and/or fibrous structures, with the advantage of being quick, noninvasive and widely accessible. MR imaging is also useful but it is not as quick and readily available. MRI can be used to detect a cartilaginous bar or fibrous band; however, it is more useful in ruling out spinal cord abnormalities such as a diastematomyelia [9,36]. The classification of SD remains based on the clinical cosmetic appearance as judged by the Cavendish classification, and the radiological scapular height as judged by the Rigault classification (Table 1) [15,26,30,37]. Table 1 The Cavendish clinical and Rigault radiological classification of Sprengel deformity. The Cavendish classification based on the severity of scapular elevation, by assessment of the degree of the visually perceivable deformity considering the difference between the position of the deformed scapula and that of the healthy one or, in case of bilateral Sprengel shoulder, the difference between the position of the undescended scapulae compared with their healthy expected anatomical position [26,30]. On the other hand, the Rigault radiological classification estimates the level of the superomedial scapular angle compared to the vertebrae . Rigault classification estimates the amount by which the scapula is raised in regards to the position of the medial angle of the scapula on standard images (Table 1): slightly raised with superomedial angle lower than T2 but above T4 transverse process (grade I, omovertebral bone generally absent); raised to the usual degree where superomedial angle located between C5 and T2 transverse process (grade II) or severely raised with superomedial angle above C5 transverse process (grade III) . Non-operative treatment is indicated when the cosmetic deformity is mild with Cavendish grades I or II, with the minimal limitation of should function. The non-operative protocol should include physiotherapy to maintain shoulder movement and prevent torticollis, as well as observation for progression of the abnormality and assessment of the associated abnormalities. The children should be encouraged to participate in sports such as swimming to maintain range of motion . Surgical intervention is best indicated for moderate and severe SD with significant cosmetic deformity (Cavendish grades III and IV) and significant limitation of shoulder abduction . However, some surgeons used also Rigault radiological classification as Cavendish classification remains subjective and inaccurate and it is based on morphologic and aesthetic criteria only . The optimal age for surgery remains controversial and most of surgeons preferred before the age of 8 years old [16,38]; however, some surgeons recommended surgery even in older patients . The presence of associated syndromes with SD may affect the functional outcome after surgery, thus these syndromes may be contraindications for surgical treatment . The surgery for SD should target improvement of cosmetic appearance and shoulder function. The surgical options consist of scapular lowering, muscle detachment, scapular osteotomy, partial resection technique or a combination of these techniques [11,12,40-44]. The commonly performed surgical procedures include Green’s procedure, Woodward’s procedure and scapular osteotomy [11,14,40,45,46]. In Green's procedure, the skin incision is long, curving around the superomedial scapular corner and finishing 5 cm below the inferior angle . The procedure involves the release of all muscles at their scapular insertions, resection of the supraspinatus fossa and omovertebral bone (if present), reattachment of muscles after caudal mobilization of the scapula, and muscle lengthening as needed [14,40]. A number of modifications have been added to the original Green's procedure which include: securing the inferior scapular angle into a pocket of latissimus dorsi to avoid skeletal traction by percutaneous wire , non-release of serratus anterior muscle to provide early postoperative mobilization , osteotomy of the clavicle and fixation of the inferior pole of the scapula adjacent to a rib , osteotomy of the base of the coracoid process and fixing of the scapula to a lower rib , and recently fixation of the medial portion of scapular spine to contralateral posterior iliac crest . The Woodward procedure has become the most widely used technique for the management of SD, since its first description in 1961. The procedure relies on release and relocation of the origin of the muscles attached to the medial border of the scapula in addition to resection of omovertebral bone, using a midline skin incision from the spinous process of C4 to T9 [11,14]. The contemporary results of Woodward procedure showed a positive correlation of functional and cosmetic outcomes through short and long terms [45,49], with the procedure and more improvement occurs in cases of younger age at the time of surgery . Moreover, the Woodward procedure may be more physiologically and biomechanically adapted than Green's procedure since it displaces more distally the origin of muscle insertion and combines glenoid varus correction with scapular lowering as the deformity does not only concern scapula but its whole region . The modifications in the Woodward procedure have been proposed to include additional excision of the medial border of the scapula to prevent postoperative apparent winging of the scapula by decreasing its horizontal width , Anterior release of the scapula followed by its rotation to correct the varus orientation of the glenoid cavity , or combination of the lowering of the scapula with correction of the varus position of the glenoid by placement of an absorbable suture through the superomedial portion of the scapula . Recently, Soldado et al  performed a minimally invasive approach endoscopic Woodward procedure in one patient with access through two small incisions at the level of the upper and lower angles of the scapula. Near-symmetrical shoulder elevation was achieved, with an excellent cosmetic result. The vertical scapular osteotomy can correct cosmesis and shoulder function via the creation of scapular osteotomy at about 1 cm from the medial border in addition to the release of fibrous bands tethering scapula to the chest wall. The procedure associated with satisfactory results, however, the presence of complex rib anomalies may affect the postoperative outcome [44,51,52]. Another scapular osteotomy technique was described by Mears , including a partial superomedial scapular resection, removal of any omovertebral connection and release of the long head of triceps from the scapula, which results in early restoration of shoulder function with significant improvement of cosmetic appearance [43,52-54]. During the inferior migration of the scapula, there is a risk for compression and injury of the brachial plexus resulting in postoperative brachial plexus palsy; however, many of these palsies are transient [41,42]. Therefore, it is important to prevent brachial plexus injury through clavicular osteotomy in order to reduce traction on other structures, in addition to intraoperative monitoring of somatosensoryevoked potential . Postoperative scapular winging is another complication after the surgical management of SD which is common after both Green’s and Woodward procedures. Winging may be a result of abnormal height to width ratio of the dysplastic scapula, or due to the mechanical or neurological failure of serratus anterior . Winging does not occur with scapular osteotomy, and can be managed by excision of the medial scapular border [12,44]. Postoperative scars are common after surgical management of SD due to large incisions and extensive dissection which can result in hypertrophic or keloid scarring [42,54,56]. The type and degree of scarring differ with the surgical procedure, thus scarring after Green's procedure is usually large and prone to hypertrophy; however, it is at midline and less obvious after Woodward procedure. The scars after scapular osteotomy are smaller, prone to hypertrophy and do not extend into the neck [15,44]. Undescended scapula, or Sprengel deformity, is a rare but serious congenital abnormality of the shoulder girdle which may result in significant shoulder asymmetry and limited abduction. The deformity is usually associated with multiple syndromes and omovertebral bone. To obtain a proper diagnosis, a plain chest x-ray should be performed initially followed by CT with 3-D reconstruction or MRI to assess the degree of deformity, determine other abnormalities, and decide the plan for treatment. The mild cases with the non-significant limitation of the shoulder function need physical therapy with no surgical intervention, while surgery is reserved for moderate to severe cases before the age of 8 years-old. The surgical procedures aim to improve cosmetic and functional difficulties, by removal of the protruding parts of the scapula and any omovertebral bone in addition to the lowering of the elevated scapula. Postoperative outcomes depend on patient age, associated abnormalities and co-morbidity, with near similar results for each of the surgical procedure. Postoperative brachial plexus injury and scapular winging can be reduced by performing a clavicle osteotomy and use of scapular osteotomy procedures, respectively. The future introducing of the minimally invasive techniques in the management of undescended scapula may reduce postoperative scarring associated with contemporary large surgical incisions. Sprengel O. Die angeborene vershiebung der schulterblattes nach oben. 1891;42:545. Williams MS. Developmental anomalies of the scapula-the "omo"st forgotten bone. Am J Med Genet A. 2003;120A:583-7. Horwitz AE. Congenital elevation of the scapula-Sprengel’s deformity. Am J Orthop Surg. 1908;6:260-311. Samilson RL. Congenital and developmental anomalies of the shoulder girdle. Ortho Clin N Amer. 1980;11:219-31. Hamner DL, Hall JE. Sprengel deformity associated with multidirectional shoulder instability. J Pediatr Orthop. 1995;15:641-3. Ross DM, Cruess RL. The surgical correction of congenital elevation of the scapula: A review of seventy-seven cases. Clin Orthop Relat Res. 1977;125:17-23. Banniza von Bazan U. The association between congenital elevation of the scapula and diastematomyelia: A preliminary report. J Bone Joint Surg Br. 1979;61:59-63. Cho TJ, Choi IH, Chung CY, et al. The Sprengel deformity. Morphometric analysis using 3D-CT and its clinical relevance. J Bone Joint Surg Br. 2000;82:711-18. Dilli A, Ayaz UY, Damar C, et al. Sprengel deformity: Magnetic resonance imaging findings in two pediatric cases. J Clin Imaging Sci. 2011;1:13. Green WT. The surgical correction of congenital elevation of the scapula (Sprengel’s deformity). J Bone Joint Surg Am. 1957;39:149-51. Woodward JW. Congenital elevation of the scapula: correction by release and transplantation of muscle origins: A preliminary report. J Bone Joint Surg Am. 1961;43:219-28. McMurtry I, Bennet GC, Bradish C. Osteotomy for congenital elevation of the scapula (Sprengel’s deformity). J Bone Joint Surg Br. 2004;87:986-9. Soldado F, Barrera-Ochoa S, Domenech-Fernandez P, et al. Endoscopic Woodward procedure for Sprengel deformity: Case report. J Pediatr Orthop B. 2017;26:266-9. Radmore L, Thomas W, Tasker A, et al. Sprengel's deformity. Orthopaedics and Trauma. 2011;25:131-4. Harvey EJ, Bernstein M, Desy NM, et al. Sprengel deformity: Pathogenesis and management. J Am Acad Orthop Surg. 2012;20:177-86. Grogan DP, Stanley EA, Bobechko WP. The congenital undescended scapula e surgical correction by the Woodward procedure. J Bone Joint Surg Br. 1983;65:598-605. Matsuoka T, Ahlberg PE, Kessaris N, et al. Neural crest origins of the neck and shoulder. Nature. 2005;436:347-55. Wilson MG, Mikity VG, Shinno NW. Dominant inheritance of Sprengel’s deformity. J Pediatr. 1971;79:818-21. Waaler PE, Aarskog D. Syndrome of hydrocephalus, costovertebral dysplasia and Sprengel anomaly with autosomal dominant inheritance. Neuropediatrics 1980;11:291-7. St Charles S, DiMario FJ Jr, Grunnet ML. Möbius sequence: Further in vivo support for the subclavian artery supply disruption sequence. Am J Med Genet. 1993;47:289-93. Dhir R, Chin K, Lambert S. The congenital undescended scapula syndrome: Sprengel and the cleithrum: a case series and hypothesis. J Shoulder Elbow Surg. 2018;27:252-9. Solanki C, Bhat DI, Devi BI. “Os” omovertebrale variants prove it to be a misnomer. Neurol India. 2016;64:984-7. Landu JP, Hoenecke HR. Genetic and biomechanical determinants of glenoid version. In: Walch G, Boileau P, Molé D, Favard L, Lévigne C, Sirveaux F, editors. Shoulder concepts 2010. The glenoid. Montpellier: Sauramps Medical 2010;15-7. ISBN-10:2840236761. Thacker MM. Sprengel deformity [Internet]. Medscape 2018. Kadavkolan AS, Bhatia DN, DasGupta B, et al. Sprengelen deformity of the shoulder: Current perspectives in management. Int J Shoulder Surg. 2011;5:1-8. Bindoudi A, Kariki EP, Vasiliadis K, et al. The rare sprengel deformity: Our experience with three cases. J Clin Imaging Sci. 2014;4:55. Durrani MYK, Sohail AH, Khan I, et al. Sprengel’s deformity. J Ayub Med Coll Abbottabad. 2018;30:135-7. Rashid M. Sprengel's deformity- A review of the literature. Internet J Orthop Surg. 2009;15:1-6. Alghazali MI. 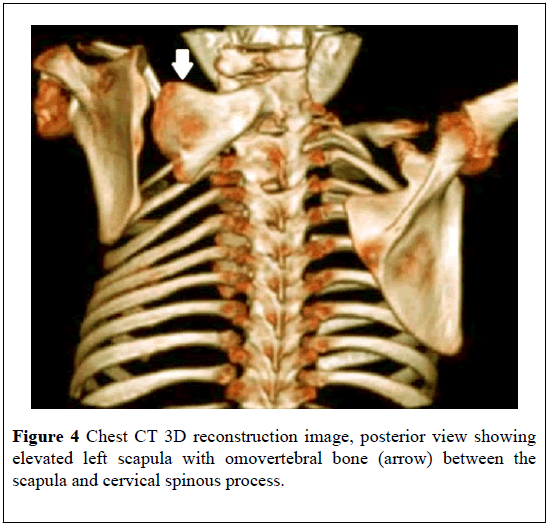 Sprengel's deformity associated with omovertebral bar between Inferior angle of the scapula and the cervical spine: A case report. Qad Med J. 2014;10:234-8. Rigault P, Pouliquen JC, Guyonvarch G, et al. Congenital elevation of the scapula in childhood. Rev Chir Orthop. 1976;62:5-26. Carson WG, Lovell WW, Whitesides TE Jr. Congenital elevation of the scapula. Surgical correction by the Woodward procedure. J Bone Joint Surg Am. 1981;63:1199-1207. Wada A, Nakamura T, Fujii T, et al. Sprengel deformity: morphometric assessment and surgical treatment by the modified green procedure. J Pediatr Orthop. 2014;34:55-62. Guillaume R, Nectoux E, Bigot J, et al. Congenital high scapula (Sprengel's deformity): Four cases Diagn Interv Imaging. 2012;93:978-83. Yamada K, Suenaga N, Iwasaki N, et al. Correction in malrotation of the scapula and muscle transfer for the management of severe Sprengel deformity: Static and dynamic evaluation using 3-dimensional computed tomography. J Pediatr Orthop. 2013;33:205-11. Azouz EM. CT demonstration of omovertebral bone. Ped Radiol. 2007;37:404. Ena AS, Roberto LS. Sprengel deformity in an infant [Internet]. Eurorad. 2018. Cavendish M. Congenital elevation of the scapula. J Bone Joint Surg Br. 1972;54:395-408. Borges JL, Shah A, Torres BC, et al. Modified Woodward procedure for Sprengel deformity of the shoulder: Long-term results. J Pediatr Orthop. 1996;16:508-13. Doita M, Iio H, Mizuno K. Surgical management of Sprengel's deformity in adults. A report of two cases. Clin Orthop Relat Res. 2000;371:119-24. Reginaldo SS, Macedo RR, Andrade AR, et al. Sprengel's deformity: Surgical correction by a modified green procedure. Rev Bras Ortop. 2015;44:208-13. Andrault G, Salmeron F, Laville JM. Green’s surgical procedure in Sprengel’s deformity: cosmetic and functional results. Orthop Traumatol Surg Res. 2009;95:330-5. Ahmad AA. Surgical correction of severe Sprengel deformity to allow greater postoperative range of shoulder abduction. J Pediatr Orthop. 2010;30:575-81. Mears DC. Partial resection of the scapula and a release of the long head of triceps for the management of Sprengel’s deformity. J Pediatr Orthop. 2001;21:242-5. Wilkinson JA, Campbell D. Scapular osteotomy for Sprengel’s shoulder. J Bone Joint Surg Br. 1980;62:486-90. Elzohairy MM, Salama AM. Sprengel’s deformity of the shoulder joint treated by Woodward operation. Eur J Orthop Surg Traumatol. 2018. Bellemans M, Lamoureux J. Results of surgical treatment of Sprengel deformity by a modified Green’s procedure. J Pediatr Orthop B. 1999;8:194-6. Leibovic SJ, Ehrlich MG, Zaleske DJ. Sprengel deformity. J Bone Joint Surg Am. 1990;72:192-7. Aydinli U, Ozturk C, Akesen B, et al. Surgical treatment of sprengel’s deformity: a modified Green procedure. Acta Orthop Belg. 2005;71:264-8. Monterrubio CA, Cázares RO. Tratamiento de la deformidad de Sprengel con la técnica Gren modificada/ Treatment of the Sprengel’s deformity by a modified Green technique. Rev Mex Ortop Traumatol. 1994;8:305-9. Walstra FE, Alta TD, Van der Eijken JW, et al. Long-term follow-up of Sprengel’s deformity treated with the Woodward procedure. J Shoulder Elbow Surg. 2013;22:752-9. Khairouni A, Bensahel H, Csukonyi Z, et al. Congenital high scapula. J Pediatr Orthop B. 2002;11:85-8. 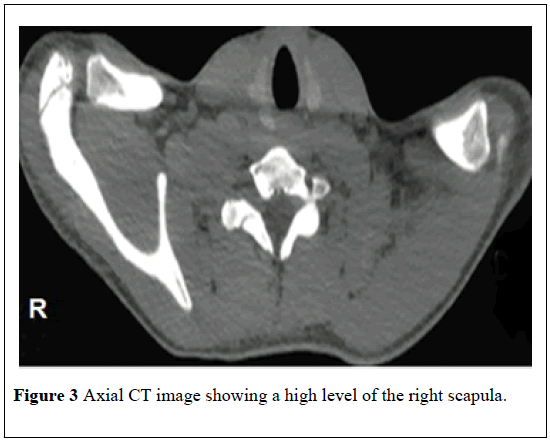 Abdelaziz TH, Samir S. Vertical scapular osteotomy in congenital high scapula. J Child Orthop. 2015;9:417-42. 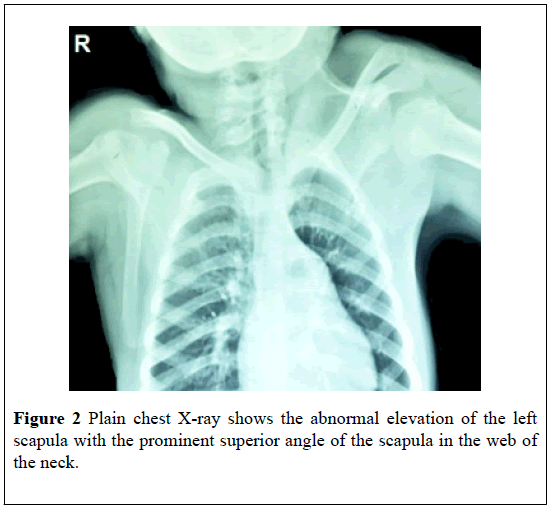 Agarwal A, Arkesh M, Jandial G. Sprengel’s deformity correction by vertical scapular osteotomy in a paediatric age group: influence of rib cage abnormalities. Int Orthop. 2018. Masquijo JJ, Bassini O, Paganini F, et al. Congenital elevation of the scapula. Surgical treatment with Mears technique. J Pediatr Orthop. 2009;29:269-74. Shea KG, Apel PJ, Showalter LD, et al. Somatosensory evoked potential monitoring of the brachial plexus during a Woodward procedure for correction of Sprengel’s deformity. Muscle Nerve. 2010;41:262-4. Farsetti P, Weinstein SL, Caterini R, et al. Sprengel’s deformity: Long-term follow-up study of 22 cases. J Pediatr Orthop B. 2003;12:202-10.